All of the entries will be auctioned on Ebay to support the Quilt Alliance. To see all ninety quilts, click here. 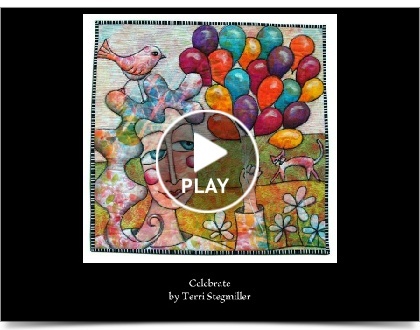 This Smilebox presentation of the twenty winners is from The Quilt Show. These are new works by the Manhattan Quilter’s Guild. Then National Quilt Museum’s newest exhibit is “From Pieces of a Nation: Civil War Period Quilts” through October 8, 2013. The quilts are from Arlan and Pat Christ’s collection. Below is a wonderful sentiment about Mary Ellen Hopkins, who passed away on July 9th, sent via Kay England from Diana Marshall. This is from Diana Marshall who like myself in the US, took care of all Mary Ellen’s Australia lectures. Wonderful sentiment..
“All reds go together.” One of my faves. Her books were easy to follow and so well done. And the family is planning a memorial service later this summer. The annual online SAQA 2013 Benefit Auction will take place beginning Monday, September 9, 2013, at 2pm Eastern Daylight Time. You can go to: http://www.saqa.com/gallery-mini-detail.php?ID=2379 now to see the works. Many SAQA (Studio Art Quilt Associates) members make small pieces to donate for the fundraiser. Below are photos of just a few to show you how wonderful the art is. I’ll post again closer to the auction starting date.